The time is right for Bermuda’s musical theatre sensation Nicholas Christopher to go dancin’ in the street. For the young Bermudian actor/singer is set to make his Broadway debut in “Motown: The Musical”, an upcoming new show about the life of iconic record label founder Berry Gordy. Featuring the classic songs of Motor City and a script by Berry Gordy himself, the show begins previews at New York’s Lunt-Fontanne Theatre on March 11, with opening night set for April 14. 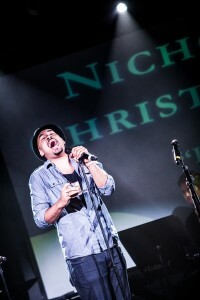 Although Mr. Christopher has appeared in two major New York productions since 2011 — the critically praised revival of the musical “Rent” and playwright Katori Hall’s searing drama “Hurt Village” – neither show was staged in the traditional Broadway theatre district, extending from 40th to 54th Street, and from west of Sixth Avenue to east of Eighth Avenue, and including Times Square and 42nd Street. Mr. Christopher will become the second Bermudian to be treading the Broadway boards during the 2012-13 New York theatre season; Rebecca Faulkenberry is starring in “Spider-Man: Turn Off The Dark” at the Foxwoods Theatre on West 42nd Street. “Motown” stars Brandon Victor Dixon as Gordy, Valisia LeKae as Diana Ross, Charl Brown as Smokey Robinson and an ensemble including Mr. Christopher, Timothy J. Alex, Bryan Terrell Clark, Rebecca E. Covington, Ariana Debose, Andrea Dora, Preston W. Dugger III, Wilkie Ferguson, Dionne Figgins, Marva Hicks, Sasha Hutchings, Lauren Lim Jackson, Morgan James, John Jellison, Crystal Joy, Grasan Kingsberry, Marielys Molina, Sydney Morton, Jarran Muse, Jesse Nager, Milton Craig Nealy, N’Kenge, Dominic Nolfi, Saycon Sengbloh, Ryan Shaw, Jamal Story, Eric LaJuan Summers, Ephraim Sykes, Julius Thomas III, Daniel J. Watts and Donald Webber, Jr.
Mr. Christopher, who attended Walnut Hill School For the Arts in Massachusetts and the Boston Conservatory, later studied musical theatre at the prestigious Juilliard School of Music in New York. Directed by Charles Randolph-Wright, “Motown: The Musical” recounts Motown founder Berry Gordy’s meteoric rise to becoming the music mogul who launched the careers of Diana Ross, Michael Jackson, Stevie Wonder, Smokey Robinson and others. The show’s score is pulled directly from the Motown songbook and will feature songs recognisable to fans of the record label’s sound. Mr. Christopher came to national attention in the US in November, 2011 when he and the cast of the off-Broadway revival of “Rent” made a surprise appearance on “Live! With Regis and Kelly” to bid a musical farewell to host Regis Philbin, who was departing the programme after 28 seasons. “Rent’s” cast took the stage to perform the show’s classic second-act opening number, “Seasons of Love”, one of the veteran broadcaster’s favourite songs. The specially re-written lyrics to the song measured the approximate length of Mr. Philbin’s television career — 995,600 minutes; the usual lyrics are “Five hundred twenty-five thousand six hundred minutes” — or the number of minutes in a year. The widely heralded ”Rent” revival, directed by original Tony-nominated director Michael Greif, officially opened on August 11, 2011 at New World Stages. Mr. Christopher played Tom Collins — a philosophical anarchist professor — in Jonathan Larson’s rock musical based on Giacomo Puccini’s opera “La Bohème”. Described as “wry and confident” by one critic, the Bermudian was singled out as one of the stand-out actors in the show by on-line gossip maven Perez Hilton. Congratulations Nicholas! What an amazing feat! I am so proud to say that a amazing singer/actor I babysat as an infant is on Broadway!!!!! You will shine!! Very nice to see some postive things done by Bermudains keep up the good work Nic. Great news…good to see some hard working young people doing positive things and realizing that hard work and great attitude equals rewards! Another candidate I say for Bermuda Heroes Day. Parade all of these hard working performers, musicians, and sports figures that are doing or have done great things in front of our youth on National Heroes Day. Let our Youth see real people that they can touch, talk to, and identify with on Heroes Day! Another Candidate for National Heroes Day!!! Parade these strong youth in front of our kids!! Bernews please help get this message to the correct ministers or persons responsible for decide who the “National Hero” will be. There are many, many more on this list, and my apologies to the many that I have forgotten to mention. Bernews – please help with a story, petition something to give our youth someone they can look up to and identify with. Our youth need role models and mentors – today more than ever. I remember you from Harrington Sound…you have come a long way man, Congrats! Congrats! Love it when our fellow Bermudian do so well on the international stage!